On Tuesday, May 19, more than 300 education leaders, supporters, students and other special guests joined Scholarship America® at its inaugural From Dreams to Degrees event at the National Press Club in Washington, D.C.
Greg Martin from General Motors, who accepted an award on behalf of the GM Foundation, recognized for its Buick Achievers Scholarship Program. Each individual remarked on the significance of supporting students in their postsecondary degrees, and for making sure that work doesn’t stop. It was a call shared by all of the participants who made the event possible. Emcee Rehema Ellis, NBC News Lead Education Correspondent, told guests about her on-the-ground reporting experiences on the importance of education. U.S. Secretary of Education Arne Duncan contributed a video message, in which he noted the nation’s ongoing work to support to make education beyond high school “attainable and affordable.” Rod Martin, chairman and CEO of Voya Financial, Presenting Sponsor of the event, remarked on how vital it is to invest in students now to ensure greater success for our future. 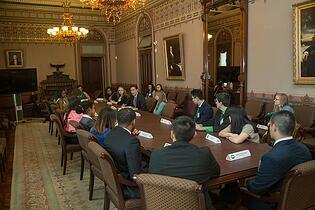 That inspiration was palpable with the students in attendance as well. 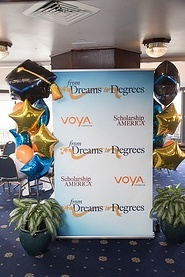 Scholarship recipients from Scholarship America’s Dream Award and Families of Freedom Scholarship Fund® programs, GM Foundation’s Buick Achievers Scholarship Program, DC-CAP and TheDream.US Scholarship all had stories about overcoming odds to work toward their degrees. And, in a surprise ceremony, 2015 graduates in attendance were recognized for their recent educational achievements! Earlier in the day, students had the opportunity to a tour the Capitol, hosted by the office of Senator Dianne Feinstein (D-CA), and participate in a special meeting at the Eisenhower Executive Office Building with staff from the Office of Public Engagement and the Domestic Policy Council. It was a day – and evening – that came full circle: celebrating and supporting students to turn their dreams into degrees. To view more photos from the memorable day, click here for students at the Capitol, and click here for the event. And, don’t forget to check out our YouTube playlist of the night! Want to get involved? 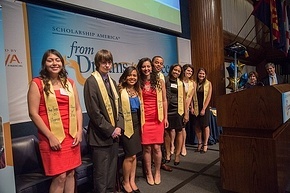 We’re excited to share that From Dreams to Degrees will be held in Washington, D.C., in 2016. Visit the event website to learn more, and stay tuned on how you can help in the coming months!